Today Samsung announced that updated versions of their Galaxy A3, A5, and A7 smartphones are about to be released. The original Galaxy A7 launched at the very beginning of this year, and both it and the other Galaxy A smartphones represented Samsung’s attempt at bringing quality smartphone construction and design to lower price points than what you would pay for a flagship phone like the Galaxy S6. With it being nearly a year since the original announcement of the Galaxy A7, it makes sense that Samsung would want to refresh the lineup. Below you can find the specs for all three of Samsung’s new smartphones. As you can see, all three devices have a degree of similarity. The Galaxy A5 and A7 in particular seem to be the most closely related, with many of the differences simply coming down to the difference in size between the two, and the drop to 2GB of RAM on the A5. The Galaxy A3 is clearly the more low end device, with a 4.7″ 1280×720 display, no 5GHz WiFi support, and additional reductions to RAM, the SoC, and the cellular connectivity. Because the Galaxy A3 omits the fingerprint scanner present on the A5 and A7 it’s also unable to use Samsung Pay. Of course, some details like the specific SoCs in use are unknown, although one can speculate based on the limited number of offerings on the market that fit the descriptions. Whether or not the Galaxy A3’s display uses a PenTile subpixel arrangement will also be an important detail to consider once it’s revealed. As for the design of the phones, they take inspiration from the industrial design of the previous Galaxy A devices but adopt some of the changes made with Samsung’s Galaxy S6 and Galaxy Note5, such as the use of glass on both the front and back of the devices. All of the phones are quite thin, and both the design and materials used mean that these definitely won’t be targeting the sub-$100 part of the smartphone market. 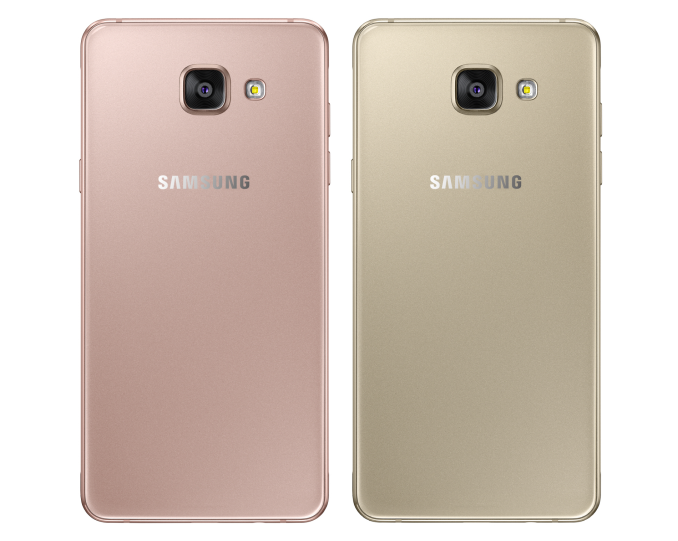 Samsung is also introducing a pink gold color which wasn’t available with the last generation models. While I don’t think any of these phones are going to have extremely low prices, it’s clear that they’ll be competing at price brackets lower than the one occupied by Samsung’s flagship phones. The launch prices for the Galaxy A3, A5, and A7 are currently unknown. According to Samsung, the phones will be launching in China later this month, with an expansion to global markets coming in 2016. We’ll have to wait and see how much the phones go on sale for in the Chinese market before we’re able to guess how much they’ll cost elsewhere, and interested buyers will have to wait and see when their availability expands to their country.